Original oil paintings by Clina Polloni. Bald Head Lighthouse, known as Old Baldy, is the oldest lighthouse still standing in North Carolina. It is the second of three lighthouses that have been built on Bald Head Island since the 19th century to help guide ships past the dangerous shoals of the confluence of the Cape Fear River and the Atlantic Ocean. 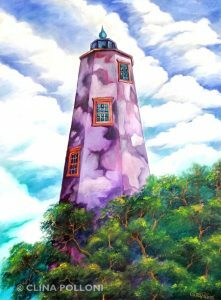 “Old Baldy”, Embraced by the passing white clouds on a blue ocean sky. Oil on Canvas 24”x 30”. 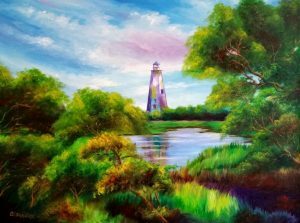 “Old Baldy with Laurel Oak Forest”, When a storm hits the island, the forest acts as a buffer. Oil on Canvas 18”x 24”. 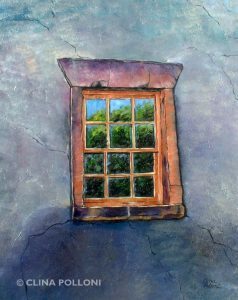 “Reflections”, A Window at the Bald Head Lighthouse. Oil on Canvas 24”x 30”. Using oils or acrylics, start painting the sky with the clouds. Continue with the lighthouse and the trees.